The Earlie Braggs Quartet CD, It's About Time, can be ordered here. Many people know Earlie Braggs as a charismatic person who helps people find music for many occasions. He is best known, however, as a jazz trombonist, bass player and vocalist. Earlie Braggs is an experienced jazz professional with extensive training contributing to his professional performance career. He has performed throughout the United States dating back to 1975. Some of these performances have been with music ensembles backing some of the worlds’ most renowned jazz artists and entertainers including trumpeters Cat Anderson and Clark Terry, clarinetist Henry Questa, jazz violinist Claude “Fiddler” Williams, 'Master of the Sax' Richie Cole, jazz pianist Jay “Hootie” McShann, Della Reese, Nancy Wilson, Steve Allen, Cab Calloway, the Tommy Dorsey Orchestra and the New York Voices. From 1997 through 1999 he went on several jazz tours with the Illinois Jacquet Big Band to Europe (France, Germany, Holland, Switzerland, the Czech Republic, Belgium), and the U.S.- Kansas City (Kansas City Jazz Festival), Chicago (Chicago Jazz Festival) and New York's famous Lincoln Center. 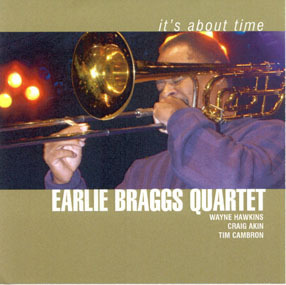 It’s About Time is Earlie's first CD with the Earlie Braggs Quartet. 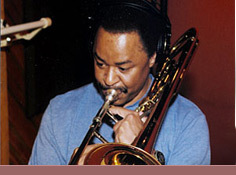 His discography with other orchestra leaders and artists includes Mentor, with the Kerry Strayer Septet featuring Gary Foster, Kerry Strayer's Christmas in Kansas City, and Steppin’ Out, with the Jazz Heritage Orchestra (a professional jazz orchestra organized through the Black Studies Department. at Cleveland State University), among others. Copyright (c) 2007-2018 Earlie Braggs. All rights reserved. Web Design by Gull Lake Websites.